The crazy continues around here. Mix normal end-of-term crazy in with life crazy and imminent moving crazy, and you’ve got yourself one twitchy knitter. I am starting to get the spring cleaning and furniture-rearranging and possessions-sorting impulse (making order out of chaos? go figure), except I can’t actually get on most of that until I’m actually fully moved back home again for the summer, and that’s happening in stages over the next few weeks. But I can at least start with the knitting. A few needles have been piling up in corners, post-Finished-Object, and my notions kits have lost all sense of order. The one that sits at home took the corner of a soda spill the other day and sticky stitch markers were the result, and some of the ones in the kit that sit in my handbag had started to migrate out into the world, who knows where. So, heck. That’s at least a manageable bit of ordering I can deal with. 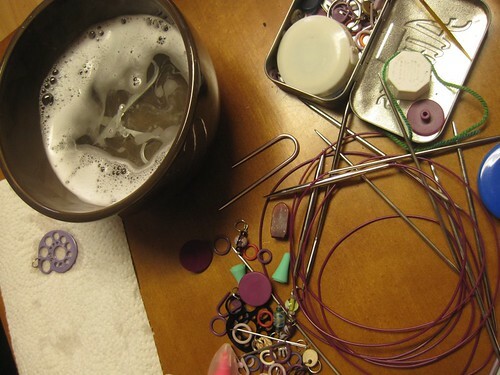 I pulled out the bigger things and gave them a clean, then dumped all the stitch markers into some steaming water for a little bath. Pleasantly good as new. It’s a start. Bigger things later on. Every little bit helps. Good luck with the rest! 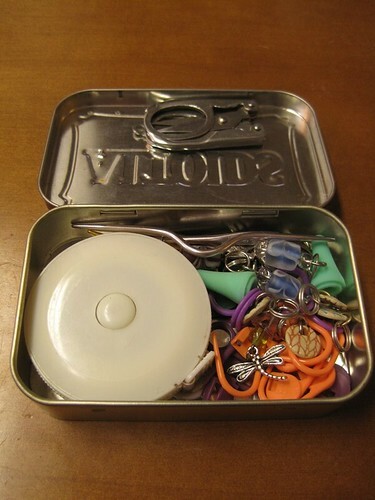 I’m sorry that your life is such chaos, but I LOVE your idea of re-using the Altoids box for notions! Thanks for the idea! I’m in the teaching game too… and the semester-thing, grading-thing, uncertainty-adjunct thing is awful. Every little bit helps. I took on my fiber room today. I realized that I have angora coming out the rafters. Such a happy looking Altoid tin. 🙂 It really does help to make order out of the chaos you can control, doesn’t it? Ugh. Come on over and take a peek in my room right now. Marking is everywhere, books for research to write my book are everywhere, clothing is everywhere (with a cat perched precariously on each pile of course), knitting is everywhere…you get the picture.